You can listen to Revoice Pro's playback through Pro Tools, VST3- or Logic (AU)-based DAW hardware. The Preferences control panel contains a "Follow DAW Playback" checkbox. If this is checked Revoice playback will start and follow the DAW in sync whenever the DAW is played. If turned off, Revoice replay will not follow the DAW. 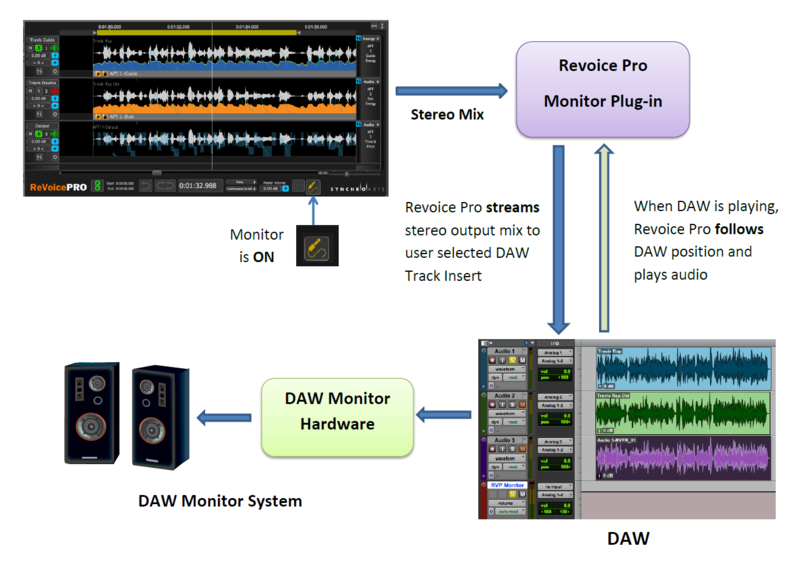 If the DAW is not playing, Revoice Pro controls the playback in Revoice Pro.This method also plays back scrubbing and looping within Revoice Pro. If the DAW starts to play and "Follow DAW Playback" is checked in Preferences, Revoice Pro also plays back, following the DAW's play head location. (Audio synchronization is sample accurate on the systems we have tested). Starting Revoice Pro playback does not put the DAW into play mode.